For those BlackBerry faithful over here in the United Kingdom who may have been waiting to pick up the BlackBerry Bold 9900 from Phones 4u, you may like to know that Phones 4u will offer the BlackBerry Bold 9900 as of the 18th of this month, so not that much longer to wait. 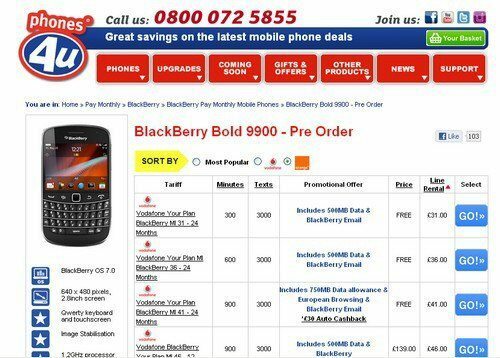 Furthermore potential customers can now pre-order the BlackBerry Bold 9900 from Phones 4u, which will be available on both Vodafone and Orange networks. The BlackBerry Bold 9900 will be a free handset on Vodafone tariff of Â£31 per month for which you’ll receive 100 minutes, 500 texts, 500MB data and BlackBerry email. The BlackBerry Bold 9900 on Orange will be a free handset when opting for Orange Dolphin at Â£37.50 per month for which you will receive 1200 minutes, 3000 texts, and 500MB data. Phones 4u have also stated that they sell over 50 percent of their BlackBerry smartphones to the 16 to 25 year old youth market and has also confirmed they would range the BlackBerry Torch 9810 and BlackBerry Torch 9860 smartphones with pricing and availability to be announced at a later date. So there you have it, if you have been waiting to snap up the BlackBerry Bold 9900 with Phones 4u, you can get your pre-order in, or just wait until the 18th of August rolls around and go get the handset. Any of our BlackBerry faithful readers out there in the UK hoping to pick up the BlackBerry Bold 9900, or are you waiting for the BlackBerry Torch 9810 to make an appearance? Fell free to let us know by dropping us a line to our comments area below.